Stock Chart and Stock Tables is a standard plugin module for displaying daily stock movement of Singapore Exchange, as well as summary of stocks that fall into the following categories: Top Active, Top Gainers and Top Losers. It is widely used in the i3investor portal, as it provides important and (almost) real time stocks movement information on a trading day. If you are a Blogger or Website Publisher, and wish to incorporate this plugin module into your website, just copy the following code, then paste it onto every page you want to show the Stock Chart and Tables. This will display a Stock Chart and Stock Tables like below in the body of your page. 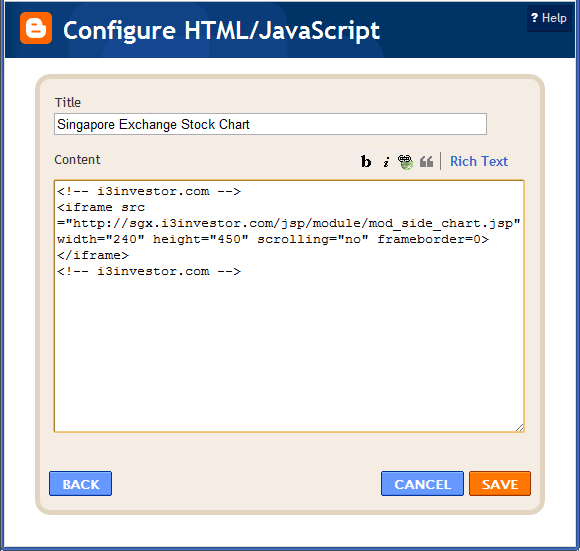 If you are publishing your blogs through Blogger.com, you can use the following 3 simple steps to add the Stock Chart plugin module to your blog. Select "Add a Gadget" from the Blogger Layout page. Provde a Title and paste the code above into the Content of this Gadget.